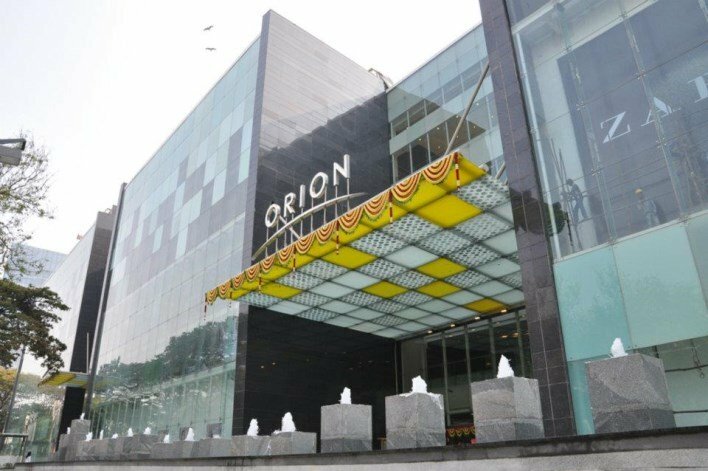 Shining bright on the list of Malls in Bangalore is 8.5 lac square foot Orion mall at Dr. Rajkumar Road in Rajajinagar, Bangalore. The four floor building houses everything from high end brands to casual buys. The variety doesn’t stop there. Orion mall has some of the famous Gourmet restaurants and also everyone’s fast food favorites. The accessibility and space utilization, with ample parking space and good ambience make it a good place to shop and relax. Orion mall is made keeping the customer and there is everything under a single roof, from vegetables to LED TV’s. Shoppers Paradise: With over a 100 branded stores Orion is a shopaholic’s delight. International clothing brands such as: Mango, Nautica and Jack and Jones have their stores, so does Indian ethnic wear brands such as Jashn and Manyavar. The upper ground floor and first floor houses the Star Bazzar a hypermarket for your daily grocery shopping. Entertainment Galore: The PVR Cinema multiplex in Orion is considered to India’s finest with the largest seating capacity. It also boasts of a 27 lane bowling alley called PVR Blu-O. With its ambient blue lighting Blu-O gives a totally international experience. Blu-O also includes a whole playing experience with X-box lounges as well as karaoke lounges as well as a tattoo studio. With India’s first Youngistan bar, it is one of the favourite hangouts for the young crowd. Even the kids have a place to play, at the Timezone. With Merry go round and an arcade games this is best place for the little kids. Gastronomical Delights: Orion brings the food of the world to your plate. From Italian, to Chinese to Mexican, there is fine dining in variety of cuisines. From Indian restaurant chains such as Mainland Chine to America’s favourite Mexican joint Chillis, there is food for every palate. If it is quick bite that you prefer the food court interestingly called ‘Saucepan’ offers all the fast-food favorites, from pizzas to dosas, everything is available at the food court. For the sweet tooth there are kiosks of Baskin Robbins, Cookie Man and Sweet World. Complete Pampering: If one is tired of shopping, one can head to the Footworks spa. For the full salon experience there is The Affinity Salon that offers a range of services, right from haircut to pedicures. Star Attraction: Not only does Orion host many events, from kid’s festival to fashion shows but it is also one of the hot spots to see one’s favourite celebrities. From Deepika Padukone to Steve Waugh, Orion is one of those malls where famous people love to drop in.The movie stars are often spotted at the multiplex to promote their movie. Mall Timings: 10am to 10pm. Location: The Orion is located at the Brigade Gateway Campus. it is easily accessible from any of the entrances of the Brigade Gateway. The nearest landmark being Metro Cash and Carry at Dr. Rajkumar road in Malleswaram-Rajajinagar.